The use of language in two of Maryam Taghavi’s recent works is bold and timely in the aftermath of the Trump Administration’s travel ban. 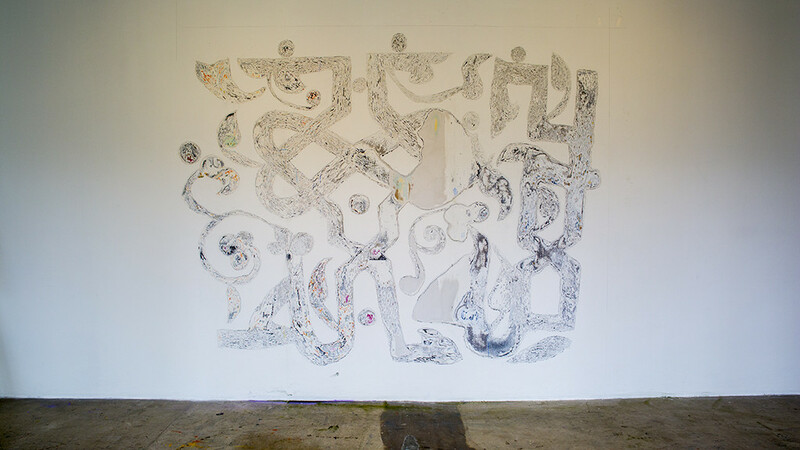 In Reconstitution, a group exhibition at LAXART in Los Angeles, the U.S. Constitution is painted on the façade and the interior walls of the gallery in the artist’s native language, Farsi. Curated by Hamza Walker and Catherine Taft, this exhibition is a revision of the 1987 exhibition entitled Constitution which, in marking the 200th anniversary of the U.S. Constitution, brought together 40 artists at the Temple University Gallery in Philadelphia. At the gallery, the Constitution was painted on the walls in its original language, English. Drawing on that exhibition, Reconstitution attends once again to the Constitution, but at a much different historic juncture. If Constitution responded to the shift from the War on Poverty, the Civil Rights Movement, and the Feminist movements of the 1960s’, to the Reaganism of the 1980s’ and its attack on such progressive debates, here Reconstitution points to yet another shift, this time from Obama to Trump—speaking to the deeply divided American electorate. If in the case of Constitution English was the language that could speak to those shifts, this time the tongue to speak with had to change. This time the Constitution had to be written and read in the language of those who were singled out by the Ban and directly affected by this abrupt turn of events. 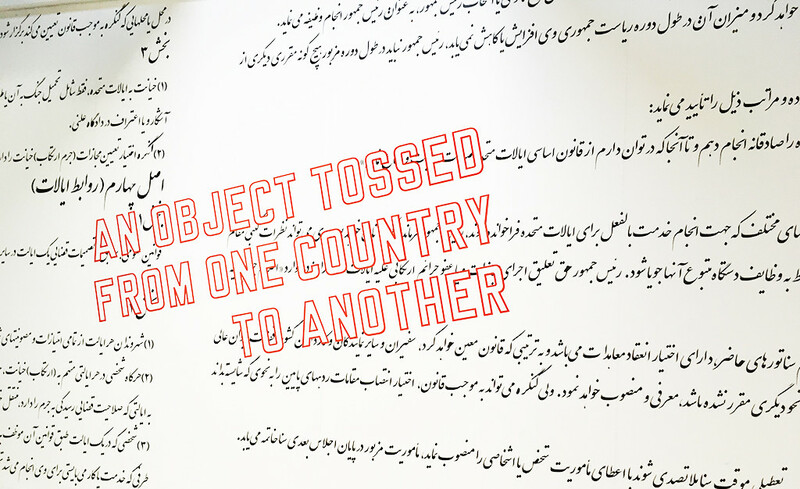 While illegible to many of the audiences of Reconstitution, Farsi is, in fact, legible to many residents of the neighborhood in which the exhibition took place. West Hollywood is mostly populated by Iranians who arrived in the aftermath of the 1979 Revolution, as well as the more recent immigrants. These residents, along with those from Iraq, Libya, Somalia, Sudan, Syria, and Yemen—all singled out by the Ban—confront the Constitution anew; looking and searching for their place and their rights in and within the letters of the text. The Constitution written in Farsi thus has a double function. On the one hand, it gestures towards inviting those to whom Farsi is illegible to try to see the Constitution along with the ways it is executed through the tongue of the other. And on the other hand, for the many Farsi-speakers of LA, specifically in West Hollywood, it brings home the political concerns of the country that many consider their second home. 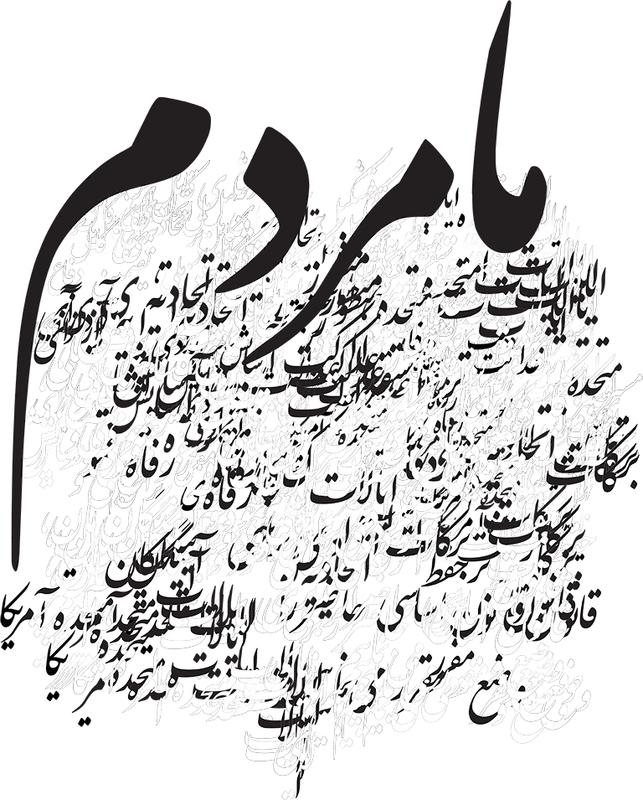 In Reconstitution thus Taghavi uses language as a tool to alter the audiences’ vantage point into (il)legible Persian as a way of compelling them to rethink the legibility of the U.S. Constitution, and to reconsider to whom, exactly, the “we” of its Preamble refers. In Reverse Archeology, her most recent work, she furthers her exploration of the often fraught relationship between language and politics. This time she complicates and evades the familiar—and these days frequent—discussions of identity politics even further through her use of language. Here in Chicago, Taghavi carves a talisman for protection into nearly 80 layers of paint in the permanent wall of the Sullivan Galleries at the School of the Art Institute of Chicago inside Louis Sullivan’s historic building from 1904. This time her work foregoes the particularity of Farsi to reach a different layer of generality. What she puts on the wall goes deeper, both literally and symbolically: she no longer writes on the wall but carves the talisman into it, bringing out the wall’s history of its own, revealing its layers of color. The 100-year-old wall of the Sullivan Gallery thus becomes involved in Taghavi’s storytelling, and the multiple layers of color are indices of the voices, hands, and bodies of those who have worked on the wall before. Her excavation almost gives voice to those whose words and gestures have been enfolded into the wall. But this use of language goes deeper in another sense too. This time what she carves into the wall is, in essence, illegible. The talisman that Taghavi has appropriated and carved on the wall is an architectural fragment whose Arabic script—on the sovereignty of God—is incomplete. What is carved into the wall is an ornament; it is decorative. It, in other words, is meant to be integrated into the wall instead of popping out, instead of forcing its authority on the audience. In this depth—both literal and figurative—and in remaining illegible to us all, her work this time searches for, or rather, begs for a commonality. Her archeology does not aim to excavate an object, but by carving an object in the wall, it is excavating a spirit: it is a demand for commonality in the face of widespread uncertainty. Reverse Archeology also disrupts conceptions of space and the passage of time. By carving this talisman—a replica of an Egyptian artifact from the Metropolitan Museum’s collection in New York—on the walls of Sullivan Galleries in the heart of Chicago, Taghavi returns the power absorbed by the institute (e.g. Metropolitan Museum) to a personal rendition of the artifact. She pushes the spatial power of the artifact further. It is not only moved from the Metropolitan to the Sullivan Galleries, but, she reminds us, from Egypt to the U.S. Highlighting this relocation and resurrecting the power of the talisman, this time in the city of Chicago, begs the question: from what and from whom are we being protected? Niloofar Sarlati is a PhD candidate in the Department of Cultural Studies and Comparative Literature at the University of Minnesota, Twin Cities. She is a fellow at Paris Program in Critical Theory where she is completing her dissertation tentatively titled, Words of Exchange/Gifts of Words: The Surplus-Value of Politeness in British and Iranian Economies of Modernity. November 16, 2017 | Filed under Art Seen: National and tagged with LAXART, Maryam Taghavi, Metropolitan Museum of Art, Niloofar Sarlati, Sullivan Galleries, The Seen.